The Carrie Shirt in Mauve Animal Print is a staple shirt that every woman needs in her closet, it can be dressed up for work, tucked into a tailored pair of trousers or pencil skirt alternatively dress it down with a pair of leggings for a casual, yet stylish weekend look . It's a full length sleeves can be rolled up and buttoned on the sleeve for a more relaxed effect. Add a glam pair of heels to this look and you're ready to turn heads. 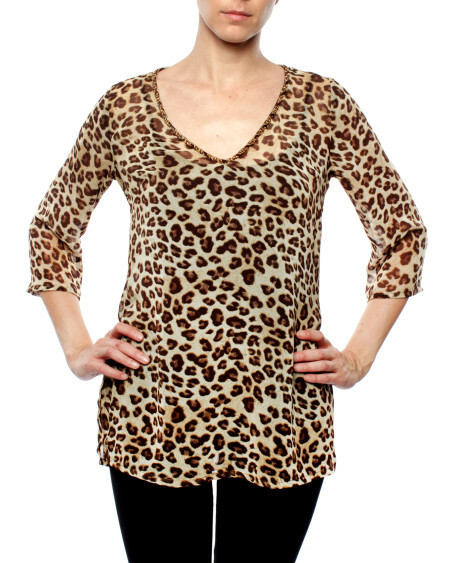 Update your look with this Elba Shirt Animal Print byJàtine. This is a v-neckline shirt with hand beading detail done by highly skilled women from all around South Africa. Each garment is slightly different making it unique and personalized. The 3/4 sleeves and longer hemline allows for it to be worn over leggings, tucked in or over a bikini as a cover up.